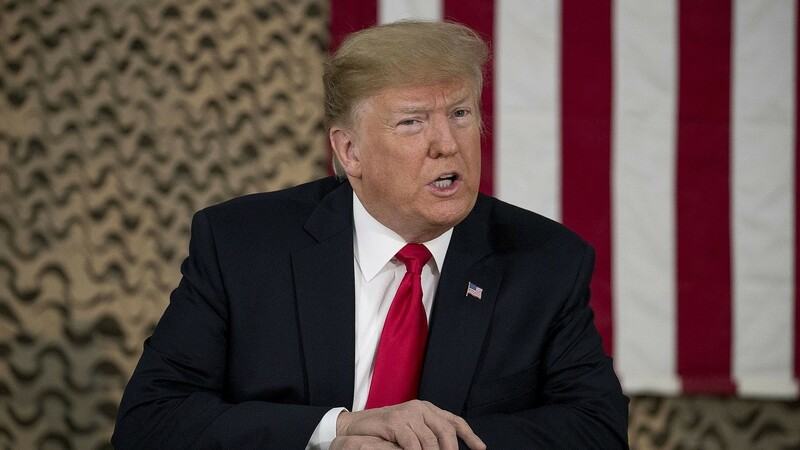 WASHINGTON — US President Donald Trump on Wednesday said he was not worried that pulling troops out of Syria could endanger Israel, citing vast American military aid to the Jewish state and saying it can defend itself. Speaking with reporters, Trump was asked about criticism that the move could put Israel in jeopardy by allowing Iran to expand its foothold in Syria. “So that’s the way it is,” Trump said, according to a White House transcript. “We’re going to take good care of Israel. Israel is going to be good. But we give Israel $4.5 billion a year. And we give them, frankly, a lot more money than that, if you look at the books — a lot more money than that. And they’ve been doing a very good job for themselves,” he added. It was not immediately clear where Trump’s figure of $4.5 billion or more came from. The United States currently allocates $3.8 billion to Israel every year as part of a defense aid package forged between the Obama administration and the Netanyahu government. The memorandum of understanding provides Israel with $38 billion over a 10-year period, which includes funding for Iron Dome system and other missile interception programs. The Trump White House has maintained that agreement since taking office, despite Trump complaining about foreign aid disbursements. The president on Wednesday cited his decision to move the US embassy from Tel Aviv to Jerusalem as evidence of his commitment to Israel. Last week, Trump said that he would withdraw all US soldiers in Syria, a decision that was met with shock within the US government as well as among regional allies. Defense Secretary Jim Mattis announced his resignation shortly after the announcement that Trump was pulling back the nation’s roughly 2,000 soldiers in the country. The president has voiced an isolationist justification for his decision, saying that it is not America’s role to manage international crises. Israel has repeatedly warned in recent years that Iran is seeking to establish a military presence in Syria, where it is fighting alongside Russia and its Lebanese proxy Hezbollah on behalf of Syrian President Bashar Assad. Israeli officials have said that America’s absence would open the door for Tehran to create a so-called “land bridge” from Iran, through Iraq and Syria, into Lebanon and to the Mediterranean Sea. “We will study its timetable, how it will be implemented and — of course — its implications for us. In any case we will take care to maintain the security of Israel and to defend ourselves in this area,” Netanyahu said in an English-language statement released by his office immediately following Trump’s announcement on December 19. While most American troops have been stationed in northeastern Syria, backing Kurdish fighters, a smaller number have maintained a presence along the Iraqi border at al-Tanf, frustrating Iranian efforts to move weapons and technology. Diplomatically as well, the US retreat is seen as essentially ceding the battle arena to Russia, which has been less amenable about Israeli demands to keep Iran from entrenching itself militarily. On Wednesday, Russia vocally protested following reported Israeli airstrikes on alleged Iranian weapons sites near Damascus. The Israeli military said Tuesday night during the airstrikes that it deployed its air defenses to shoot down a Syrian anti-aircraft missile shot at the country, in what some interpreted as a sign that Assad had been emboldened. The airstrike was the first attributed to Israel since Trump’s announcement of the troop withdrawal. This entry was posted on December 27, 2018 at 10:45 AM and is filed under Uncategorized. You can subscribe via RSS 2.0 feed to this post's comments. You can skip to the end and leave a response. Pinging is currently not allowed.